Ultimate Lost Kisses is Lost Kisses with better artwork & better storytelling. Stories of the emotional traumas that shaped a woman's life. The biggie in this set is ULTIMATE LOST KISSES #11. Why? Rather than Mitchell’s traditional stick figure art, Dave Sim! steps in to handle art chores. Mitchell also tackles a serious story here, which hasn’t been the case in earlier efforts. A woman in her mid-30s receives a letter from the child she gave up for adoption as a teenager and goes to visit him on death row, and what she discovers is a grand loss of life in more ways than one. Even without Sim on the art, this is easily the best work Mitchell has produced in these minis, and I was pretty pleased to see it. Without some growth, this series was going to get stale in a hurry. And if you’re a fan of the artist? This might be the most unusual collectible out there where you can find his stuff. WHA? Dave Sim?? Yeah, it’s true — the one and only Mr. Sim did the art for this issue, which is a huge departure from Brian’s usual stick figure drawings. It’s a for better or worse scenario in the sense that this isn’t an issue of the Lost Kisses series I know and love. Instead, it comes from some sort of deranged alternate Lost Kisses universe where the past is both haunting and daunting (instead of overwhelming and mildly sad like it’s been in the first ten issues). The art and words of this issue are both intense, leaving me emotionally fascinated but also drained. All said, this is a gripping story with good art (just a few too many re-used images). The story itself is very engaging, a tale of loss and forgiveness. It leaves you feeling a bit queasy and angry. Pretty amazing for a comic that is almost as small as a quarter and has single panels and a line of text under it on every page. The micro-mini comic is only $1 from the above link. Mitchell took the “Lost Kisses” title in a totally new direction with the first issue of “Ultimate Lost Kisses.” This issue features artwork by the legendary Dave Sim, and it focuses on someone else's life for a change. The story involves a woman in her thirties who got a death row letter from the son she gave up when she was a teenager. While the story is a huge shift for the series, the frank and personal nature of the issue is right in line with what the series has been about so far. While previous issues of Mitchell's Lost Kisses have been humorous, issue eleven dubbed Ultimate Lost Kisses, takes a decidedly dark turn. This one's about a mother who gave her son up for adoption while she was in high school. Years later he's tracked her down. The letter she receives from him begins a journey of revelation that gets worse with every step. Obviously the artwork by an accomplished storyteller like Dave Sim adds to the impact of the story. He adapted quickly to the micro-mini's one-panel-per-page pacing. Past editions have kept the reader at a distance as the characters deliver sarcastic quips and jabs. Here, it's all drama. Sim switches from long shots to close-ups—even extreme close-ups—to drive the story forward. There's a terrific spread typical of Sim's contribution to the book, that shows only the hands of the son and his mother—the physical space between the pages separating them. The posture of each, in the context of the story, shows their raw emotions quite effectively. This drama is a real departure for the series. It could've easily been published as a one-shot. Either way, it's a special issue, well worth the price of admission. The first and longest running series from Silber is Lost Kisses - which up until the tenth issue, featured a very happy looking stickman who offered stream-of-consciousness thoughts upon horrible events that occurred in his life. Frequent topics include morbid thoughts on death, life, love and having no direction - which in normal circumstances, would be typical Kinkos-indie fare. The difference this time, however, is the fact that while all of these terrible topics are being discovered, the main character greets (almost) every though with a big ol’ smile. Even the thought of his own death. With art by Dave Sim. And yes, it’s that Dave Sim. The story in this one is completed by the end of the issue, and concerns the events of a mother who is seeing her son for the first time since she gave the boy up. He’s in jail. Now, I won’t go into the details of the story - much more detail than what I just gave would pretty much ruin the whole thing. It featured a word that I really, really don’t like in my comics (they’re supposed to be entertaining, right? ), and that coloured my enjoyment of the book adversely. I should just say that despite this, the story is incredibly solid, with some fine art by Sim. Just be warned: things get pretty dark. In the end, what I believe it succeeds in the most is being a sly commentary on the mainstream’s predication for the “big creative team relaunch” - just using indie comic book tropes, rather than superhero ones. This is a serious story about a serious subject. A mother who had to give up her son when she was younger. Now he contacts her. He wants to meet. She does what she knows is right even though it is hard on her. We follow her thoughts as she thinks about what might have been if she had kept her son. The art showing this mother does bring out her emotions. Her son was put in a bad situation and he did what he had to. He took care of a really bad man. A man that deserved what he got and a lot more. This is a powerful story that will touch your heart. Ahh, the joys of teenage pregnancy — mom is getting her scream on, the baby's father is clearly a douche, and our decisive heroine is positively overflowing with the legendary wisdom of sixteen-year-old girls. It is all so depressingly plausible, and plausibly depressing — up until the part about running away to the Midwest to have the baby. It's probably just my snobby East Coast roots talking, but who runs away to the Midwest? I know people read comics for different reasons, but when I want a real downer of a story with a messy ending, I will just go read the paper. What I have seen in Ultimate Lost Kisses 12 did not fill me with the urge to read the rest of the series. Maybe it is not all as grim as this issue, but if this is representative, this is not the escapism I want from comics. Also, the mother's face scared me a little. If that was the artist's intention, and I think it was, I say, well done, sir! In all fairness, not everyone reads comics for the same reasons. My strong aversion to this story attests to its basic realism, and no doubt there are readers who will love it for exactly the reasons I do not. At heart, this is a sympathetic look into a specific answer for the kind of existential questions most people have at some point — How did I get here? Where did life go off the rails? Folks who like their comics less fantastic and closer to home will probably really appreciate this one. 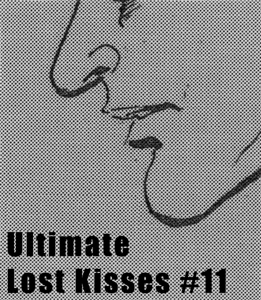 I’d also recommend ULTIMATE LOST KISSES #12. Here, Mitchell and artist Jeremy Johnson tell a tragic story of a teenage girl who sees her life destroyed in the space of only a few moments, and give us clues as to what will happen to her afterward. This comic has a nice bit of emotional resonance to it and shows good depth in the writing. It still bothers me a little that the ampersand is used here in place of “and,” because it just doesn’t flow well visually. This issue captures the sense of isolation a young girl in this particular predicament must experience, and her blind optimism in the face of that challenge. The thin emaciated lines seem to fit the harsh tone of the story. The panel to panel storytelling is a bit choppy since every page is a new panel, which brings with it a new scene or conversation. Grade B. A sixteen year old girl is always tired and has no idea why. Than she finds out and knows but what will she do? She is filled with stress and lots of it from her mother. She makes a decision that she will have to live with for the rest of her life. This is a powerful emotional story about a real life situation. A woman is supporting her boyfriend a wannabe musician. He seems more like a lazy good for nothing. He is pleasant enough. He just does not earn a living. He leaches off of her. Here the woman does step up and she leaves him to start her life anew. She shows she has what it takes to move on. The art does look good. It is simple but nice and plain to see the emotions of the two people involved here. The woman is an inspiration to others. She stands up for herself and does what is best for her. A daughter's mother is dying. They have never had a close relationship but the daughter still loves her mother. When the daughter sees her mother the drawing shows off just how sick she really is. She looks awful. The emotions are strong here. The story is sad in many ways. It is something that could happen and does happen. It will make you think and touch at your heart. Did you ever have some completely happy news on your end torn apart by the person that you’re relaying the news to? That’s the subject of this comic in a big way, as the star of the story is a young married woman in her 20’s who calls her mother to tell her that she’s having a baby. This is almost universally a cause for celebration (at least to somebody in a stable relationship and living situation), but her mother immediately tells her to get rid of it, that it will destroy her life and her figure. It’s impossible to ignore the obvious implication: her mother feels like having her 20+ years ago ruined HER life. The rest of the comic is a tour through the childhood of the pregnant woman, her feelings about that and the reaction, and how she decides to go forward from there. It’s an intriguing story, and a good reminder that relaying news to loved ones can often uncover some unpleasant truths. $1 as usual, and as usual you should go nuts and get at least a handful of these comics when you’re ordering, as they are tiny. 'Ultimate Lost Kisses Fifteen' is the story of a woman telling her mother that she is pregnant. The story takes an unexpected dark turn when the woman starts to react to her mother's response. This results in a realization of the damages parents do when they are resentful of their children. This story took me by surprise as I did not expect this kind of narrative in such a short comic book. The art work exploits the emotional context of the story to solicit more emotions from the reader in a clever way. Even though this is not my usual kind of story it still engaged me and entertained me.